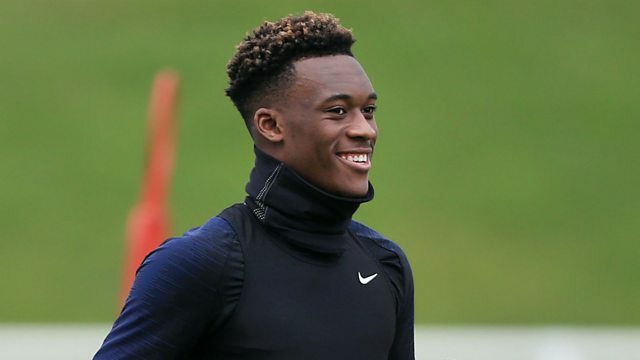 BBC Radio 5 live - Football Daily, Can Hudson-Odoi and Rice debut for England? Can Hudson-Odoi and Rice debut for England? What can we expect from England's young talent? Mark Chapman is joined by former Premier League midfielders Don Hutchison and Nigel Reo-Coker to preview the upcoming Euro 2020 qualifiers. BBC football correspondent John Murray brings the latest news from the England camp, we hear from Harry Kane and the panel discuss the call-ups for Declan Rice and Callum Hudson-Odoi. Plus, we ask how Scotland will cope without captain Andrew Robertson, discuss Mick McCarthy’s first game back with the Republic of Ireland and ask if Wales will be boosted by an in-form Gareth Bale.